How to squat a river has, as a main goal, to produce a small documentary film to create awareness about the importance of managing rivers in a participatory and democratic way. As a pedagogical tool, it assumes that a river is a common good and, as such, must be managed by all, that is, institutions and civil society. How to squat a river aims to show how communities can and should actively participate in the management of rivers. To make the film How to squat a river develops a type of participatory research. The river Jamor is used as a case study, an urban river, that flows in the suburbs of Lisbon. The target group is the population that develops squatting activities along the banks of Jamor: a large part cultivates food in squatted gardens; other people squat the river for leisure and sporting activities; there also is a movement of citizens, Let's Save Jamor, which squats Jamor in trying to stop the construction of a mega-real estate development on one of its banks. How to squat a River uses participatory research methods, such as focus groups, storytelling and collective mapping. For us, participatory research involves inquiring, but also acting. With this methodology, in addition to collecting information about how to squat a river, we also empower our target groups, increasing the impact of their practices. The future dissemination of the documentary film How to squat a river will give visibility to the squatting activities of the river Jamor, and through that, it will create greater awareness about the urgent need to make the management of all rivers more participatory and democratic. Using this pedagogical tool, anyone can squat a river and thus contribute to its’ more democratic and shared management as a common good. Participation in the Idea Camp allowed us to define the idea in a more concrete way, giving it more substance and density. The interaction with other participants, but also with facilitators and idea feeders, helped to add new features and details to our idea. Specifically, the session on audience development helped me greatly. In general, meeting so many different people and such diverse ideas enriched and inspired us, also for future collaborations. What was difficult in the realization of our project was the apprehension of the river squatters to participate in the project: many times they received us with strangeness. Given the "illegal" nature of squatting activities, river squatters feared that by gaining visibility, authorities would know about their activities and start charging them for occupying a land that it is not theirs, or even worse, they would just evict them. What also played a role was their lacking availability to participate: river squatting activities are done according to the needs of the agricultural cycles, but also according to the availability of the squatters. Many times they have other duties in their personal lives, like working or giving support to their families. So sometimes it was difficult to find them. But we managed and now we are in the phase of finalizing the small documentary film that shows how squatting activities increase the sustainable relationship between the river and the urban communities, economically, socially and environmentally. The documentary will be available online and on DVD and it will enable the sharing of precious information on how communities can rescue an urban river. 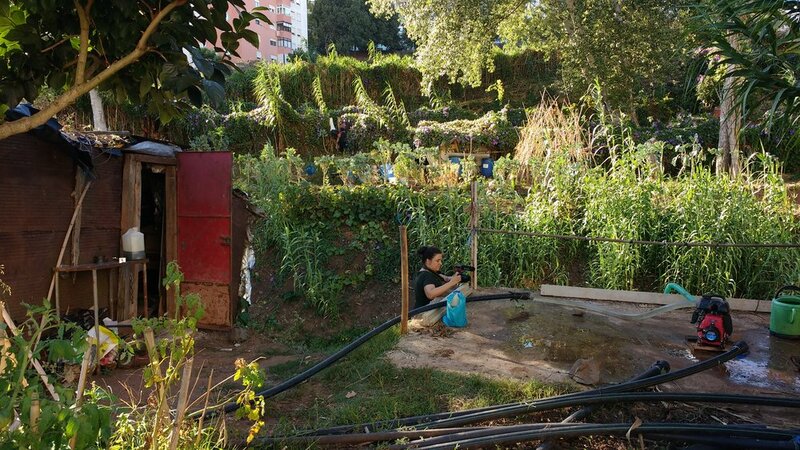 The squatting communities of Jamor and their practices will be examples of good practices in defending the commons in the urban context and in granting democratic access to urban rivers. A network of national and international partners will help us spread the produced learning tool. We hope that initiatives like the one that is happening in Jamor will take place around other rivers, all over the world.